Magnetic molecules are regarded as promising functional units for the future of information processing. An interdisciplinary team of researchers from Jülich and Aachen were the first to produce particularly robust magnetic molecules that enable a direct electrical readout of magnetic information. This was made possible by selecting the rare earth metal neodymium as the central building block of the molecule. The team's research findings were published online today in the renowned journal Nature Communications. The miniaturization of processors is approaching the limits of what is physically possible. At the same time, the global energy consumption by information and communications technologies is increasing continuously, requiring new approaches to handle the growing volume of data. Magnetic molecules provide a solution to this problem. They could take the place of conventional electronic components, such as diodes or transistors. In contrast to these components, however, they can be controlled with minimal voltage – which drastically reduces energy consumption – and have much more sophisticated switching functions that depend on the magnetism of the molecules. Magnetic molecules act as tiny magnets and are able to process information in the form of electrical signals. They always have the same number of atoms, can be designed specifically for various functions, and can be produced cost-effectively in an identical form over and over again. In order to use this 'molecular spintronics' in technical applications, the magnetic structure of the molecules must be effectively shielded from environmental influences, but at the same time, it must be accessible to electric current. "You could say that electric current and magnetism have to communicate with each other," says Dr. Daniel Bürgler from Forschungszentrum Jülich and the Jülich Aachen Research Alliance. 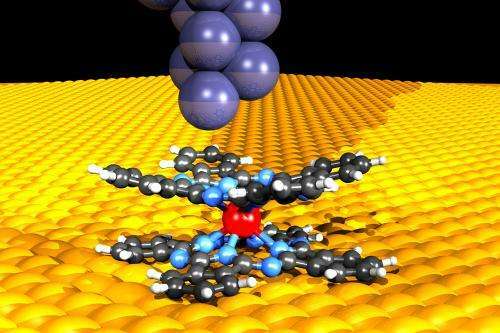 The physicist's team, located in Jülich and Aachen, has produced a molecule that fulfils these requirements: "In neodymium phthalocyanine, the same electrons that give rise to magnetism are also involved in electronic transport," explains Bürgler. The researchers were able to demonstrate this by comparing simulated data to experimental values. The metal neodymium is a rare earth metal. Molecules comprising rare earth atoms and phthalocyanines, which can be found in nature in the form of leaf pigments, are considered particularly stable and shield the magnetic state of the central rare earth atoms very effectively. However, electrical readout of the magnetic state directly from these molecules had failed in the past. Due to the electrical contacting of these molecules, the electric current was hardly influenced by the magnetic structure. In order to identify a suitable rare earth atom, the researchers first analysed the distribution of the electrons flying about the atoms like a cloud. Only some of the electrons produce the magnetic structure. These must be situated sufficiently deep within the electron cloud to be unaffected by environmental influences. At the same time, they must not be located so deep as to prevent interaction with the electrons conducting electric current. Neodymium fulfils these requirements, because it is more lightweight than other lanthanides and its electrons are distributed within a larger cloud.